Costumes, pumpkins, and candy, oh my! Indulging in eating candy is a fun way to enjoy Halloween. However, consuming too much sweet treats can lead to cavities. Also eating the wrong type of candy can crack or break teeth and cause other types of damage. 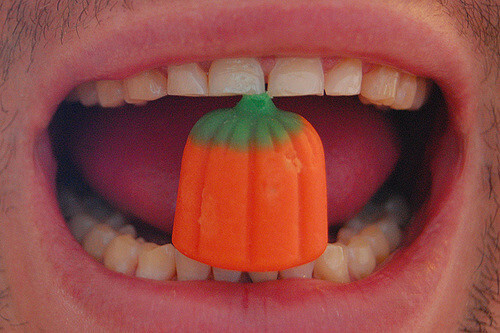 The following list is the worst and best Halloween candy for your teeth. Sugarless Candy – This type of candy contains non-sugar sweeteners. It is less likely to cause tooth decay since it doesn’t contain sugar, which is the leading cause of cavities. Sugarless candy options include gum, hard candy, gummy bears, lollipops, fruit candies, Twizzlers, Lifesavers and more. Chocolate – This tasty treat usually comes in the form of a candy bar and is one of the most popular sweets given out during Halloween. The good news is, it’s one of the best candies that contain sugar you can eat because it’s easy to remove from your teeth with a quick brushing afterward. Cotton Candy – Are you planning to consume sugary candies during Halloween? Make your choice the softest and easiest candy to eat. Cotton candy is also known as candy floss, usually comes in a bag or attached to a cardboard stick. It easily and quickly melts in your mouth. Brushing afterward is mandatory to wash sugar residue off your teeth. Taffy – This stretchy chewy candy can give your jaw a workout. The candy itself can be difficult to chew putting dental work at risk of getting damaged. Also, the sticky taffy can get caught in between teeth and become very difficult to remove. Caramels – This soft candy melts in your mouth and spreads sugar throughout all of your teeth. The sugar attaches to the bacteria on teeth and can lead to cavities and tooth decay. Sour Candies – This candy is high in demand due to the sour flavor that people enjoy. While it might be popular, it actually causes two problems since the ingredients include acid and sugar. The acid damages enamel and the sugar causes cavities. Sour candy lovers need to limit the amount they eat to prevent long-term damage to teeth. Hard Candies – These tasty sweets have been popular for centuries. They offer the chance to indulge in your favorite flavor longer than traditional chewy candies. Unfortunately, they also prolong the amount of contact sugar has with teeth which leads to cavities. Also, hard candies are responsible for many people cracking or breaking their teeth. Eat candy responsibly and always brush, floss and rinse afterward to prevent tooth decay. Keep in mind that any candy containing sugar can lead to decay, but hard candies can actually break and crack your teeth causing long-term damage. Halloween should be a fun holiday and candy can be enjoyed, just try to stick with the best candy options to maintain healthy teeth and gums. Interested in scheduling a dental consultation with Dr. Jacquie Smiles in NYC? Please call us at 212-972-3522 or contact us for more information.